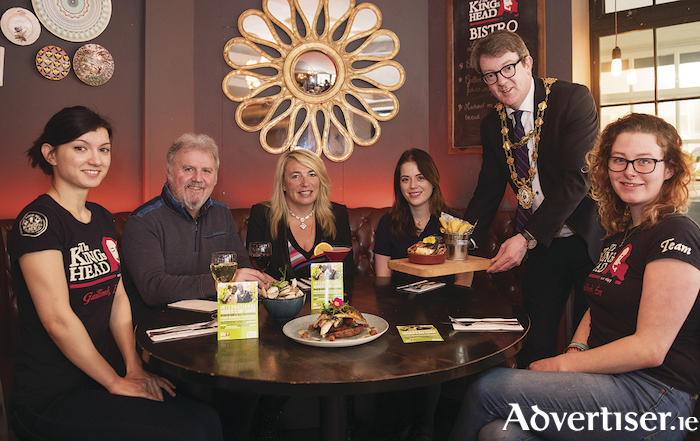 Ronan Scully from Self Help Africa was royally treated to a tasting menu with Mary Grealish and staff members Mimi Mangin, Allison Spillane, and Katie Sheedy, served by Mayor of Galway Niall McNelis, who will be among the men rolling up their sleeves to serve at tomorrow's lunch. Photo:Andrew Downes, XPOSURE. Paul and Mary Grealish of The King's Head Bistro, together with Ronan Scully of Gorta Self Help Africa, are hosting a special International Women’s Day lunch tomorrow (Friday ) in aid of Gorta Self Help Africa. The three-course charity lunch will feature The King's Head Bistro’s spring menu which showcases some of the best Galway food producers, and as a special International Women’s Day treat guests will be served their lunch by Mayor Niall McNelis, Galway Bay FM’s Ollie Turner, and members of the Connacht Rugby team. Guest speaker Mary Sweeney will give a special talk about her work with Gorta Self Help Africa by sharing her experiences and stories of women who are doing great work to make their families’ lives better in some of the poorest regions in Africa. Gorta Self Help Africa works with some of the poorest communities in Africa, helping to provide women and families with the ability to produce more food, earn more from their farming activities, and helping mothers and fathers to provide a better life for their children. The lunch is taking place on International Women’s Day 2018, tomorrow (Friday ), from 12.30pm to 2.30pm. Tickets are €30 per person and all are welcome, with all proceeds going to Gorta Self Help Africa. To book, email [email protected] or call Ronan Scully on 087 618 9094. All proceeds will go to the charity to support women’s projects in Africa. Stay up to date by following The King's Head’s social media channels on Facebook and Instagram @thekingsheadgalway and Twitter @kingsheadgalway. Friday 8th of March is the official launch of McBrides & Co bar!